The concept of house-sitting is becoming popular across Europe and North America by providing the service of taking care of people’s property (and sometimes pets), in exchange for free accommodations. It’s a great way to make new friends out of some fabulous home owners and neighbors and spent ample time in places where you could never otherwise afforded to stay. If we assume savings of $60 a night in hotels, which of course is a very conservative estimate, then that is over $6,000 saved in travel costs for a travel of 100 days. 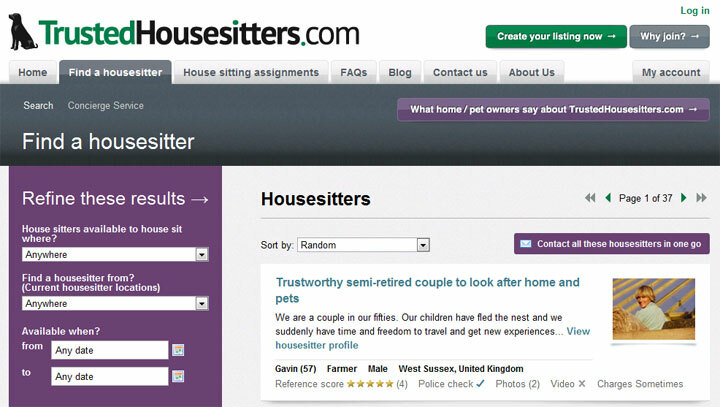 Our favorite website to use is trustedhousesitters.com. Not only does it have the best functionality of all the housesittng sites out there today, it is also quickly becoming the leading resource for European house sits. – The popularity of housesitting is on the rise. In the last year, google searches for housesitting have risen over 83%! – The ratio of house-sitters to home-owners for Trusted Housesitters is 3 to 1. The odds of getting a housesit there are much better than on other housesitting websites. – Being a relatively new site, the focus is to keep expanding into new locations – this week they have added jobs in France, Israel, Thailand, and even a Christmas housesit in Hawaii! – Right now, the website is seeing more home owners sign up than house sitters – it really couldn’t be a better time to join. There are currently 15 different countries advertising jobs for Christmas when accommodations are at a premium! – Don’t wait to sign up, even if you don’t see your ideal job posted right now. Home owners will sometimes contact potential housesitters directly, without posting a job. Also, it pays to have your profile up to date and be quick to jump on ideal jobs when they do come up!